Last week I visited The Kernel Brewery in central London. It's a four barrel micro brewery that's run by a guy called Evin, tucked away under a railway arch, sharing space with a cheese maker and a salami producer. Entering the brewery, I'm immediately met by the smell of warm malt, passing the hanging meat and ageing cheese, the copper comes into sight and is just hitting rolling boil. Before the bittering hops go in, it's time for a beer. A US style IPA with a single hop - this one being Nelson Sauvin. 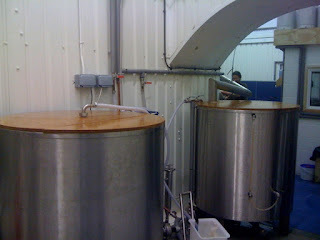 Evin's only been brewing here a few months and you get the feeling that he's keeping things quite simple for now. He doesn't appear to be cautious or worried about veering off the planned brew schedule though, joking that "there's no point keeping a third of a bag of hops, so you might as well chuck the whole thing in!" It's obvious that Evin's a fan of the US craft brewing scene. Most of the beers he describes having made are US style IPAs with a basic malt bill, US yeast and a tonne of hops. 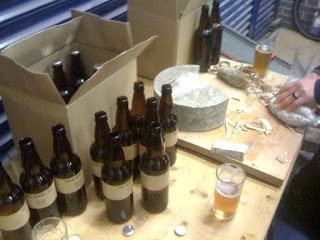 There's bottles of various age all around the place and, having been given the brewery tour, we crack a few open to try. "Centennial Pale" is a 5.7% per cent pale ale that features a single hop - Centennial. The beer is a golden amber colour with medium carbonation and a medium white head. On the nose you get loads of hop, giving some orange and zesty fruit aroma. It starts off with a very slight sweetness that's quickly overtaken by grapefruit and citrus peel. The bitterness comes in and cuts across your palate but isn't as big as you'd expect. It's a fantastically drinkable beer, that I could easily consume a lot of. The hop flavour is big but the sweetness and bitterness aren't so great that they hamper drinkability. By way of slight criticism, I'd say it could benefit with a touch more sweetness, and some dry hopping could add a freshness that's slightly lacking. Next up is a similar beer, this time brewed only using Simcoe hops and to a higher gravity - giving and ABV of 7.9 per cent. This one is a lot deeper in colour and has a far more resinous, piney nose. You also get some floral aroma and the slightest hint of some malt in the background. Evin gave me this with the disclaimer that it's not really ready and could do with a bit more ageing. He's right, it's a bit rough around the edges, the bitterness is still quite aggressive and there's a slight burn from the alcohol. Putting that to one side, this beer is jam packed with fruitiness. You get loads and loads of citrus fruit and then, specifically, grapefruit in the finish. This is like the Centennial ale but turned up to eleven, I really need to try this again when it's a bit older. Keep your eye out for The Kernel Brewery. I'm not sure what plans there are for distribution and sale of the beer, but if you ever get the chance to try some of it, go for it. I'd like to say thanks again to Evin, for sharing his beer and his brewery. I'll be popping in again soon for more beer! For the sake of completeness, I'll just add that the tasting notes above are actually from a few bottles that I took away with me. The beers were the same, I was just able to scrawl things down a bit more easily at home. Sounds great! We should arrange a time to go over and say hi. I love Centennials so definitely fancy one of those IPAs. I had a few bottles of this at The Rake near London Bridge, a great IPA. Tellis: Which beer did you have? Since I wrote this entry The Kernel brewery have gone from strength to strength. It seems like every beer they realise is a winner.